The Dictaphone PowerMic™ III from Nuance is specially designed for enhanced physician productivity, providing ergonomic control of both standard dictation and speech recognition functions. The PowerMic II microphone offers simplified, thumb-control operation for dictating, navigating, reviewing, and editing speech recognition generated documentation. Speech Recognition Hand Microphone for Use with Dragon® Medical, PowerScribe® for Radiology, and Enterprise Express. 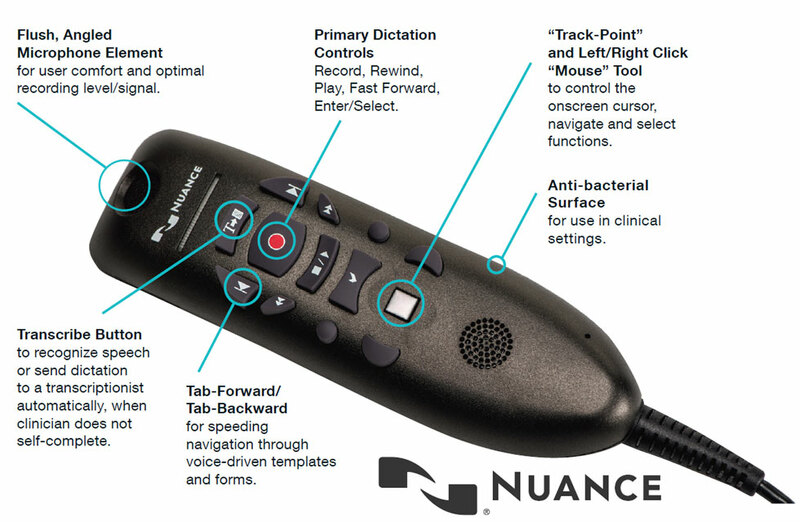 Nuance PowerMic III advances clinician PC dictation to a new level, making it easier and faster to control voice recording, navigate and select fields in on-screen templates and standard reports, and move through recognized text reports for review and editing. In addition to providing complete dictation control, Nuance PowerMic III incorporates full-function, Microsoft® compatible, PC mouse capabilities into the microphone to reduce the need for care givers to move between the microphone, mouse, and keyboard. With Nuance PowerMic III, clinicians can rapidly navigate report template fields, then record and use “voice fill-in” capabilities to insert recognized text into report templates. By combining an ergonomic hand microphone with PC mouse functions, clinicians gain new levels of dictation speed, ease-of-use, and productivity. USB connectivity for easy plug-and-play installation as well as eliminating the need for sound card-enabled PCs. Using the PowerMic III, users can rapidly navigate report template fields, then record and use “voice fill-in” capabilities to insert recognized text into report template fields. By combining an ergonomic hand microphone with PC mouse functions, physicians will gain new levels of dictation speed, ease-of-use, and productivity.